Introducing ZAMBI THE BABY ELEPHANT! He is a very special baby African elephant that delights children who dream of having their very own “exotic pet”, and also helps to improve the lives of children who have been orphaned by AIDS in Africa. Pet, tickle and touch one of the sensors on ZAMBI’S back, chest and trunk and he responds just like a real baby elephant! He moves his trunk up and down, wiggles his ears and makes lifelike trumpeting and chewing sounds! He will curl his trunk around your finger and even “blows” kisses to you! ZAMBI also has posable back legs for posing in a sitting position.ZAMBI’S ears and included bracelet is adorned with artwork created by African children. When you care for your very own ZAMBI THE BABY ELEPHANT and wear the included bracelet, you’re giving hope to children in Africa who have been orphaned by AIDS. The bracelet is included in every package so children who bring ZAMBI THE BABY ELEPHANT home can show their support for PROJECT ZAMBI and wear a symbol of their commitment. The bracelets will help children and adults spread the word about PROJECT ZAMBI and encourage others to join the cause and devote their support to the issue of caring for children orphaned by AIDS in Africa. By welcoming ZAMBI THE BABY ELEPHANT into your home and wearing the bracelet included with purchase, you can show your support for Project Zambi. We were able to get one of these cute little Elephant’s And I must say We love it! My Four Year old will not put him down! As A mom I love the fact that ZAMBI THE BABY ELEPHANT was created to help support organizations that are caring for children who have been orphaned by AIDS in Africa which Helps me feel good about buying a product that not only my kids love but that is also Helping other’s in the process. I have decided that instead of buying my nieces and nephews some toy that they play with only one or two days after Christmas I will be buying them these just because I know it’s going to support a good cause! ZAMBI The Baby Elephant Approx. Retail: $49.99 Might seem a little on the expensive side to pay for such a toy but the meaning and what it supports is so worth it to me. Information on where to buy Project Zambi online is coming soon and I will be updating this when I list this item on my Christmas Gift Guide Because so Far Zambi is my #1!! Safeway and Looney Teams have Teamed up For "Eating Right Kids"
The Other Day I Received a nice little lunch bag with some Goodies Thanks to Team Mom And Safe Way! I left It On the Table and thought Ok I will look over this later. BIG MISTAKE Somebody took the chewy bar and juice and left me the pasta and Fruit! The Funny part still today Nobody Has even admitted who it was so I have no clue but If I was betting I would say my 4 year old princess jada did it! 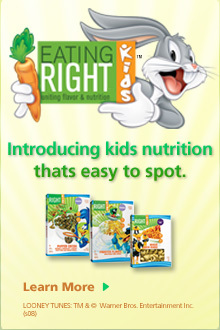 Eating Right Is a Full Line of Foods that are not Only Tasty But Better for your child. It Has Been Formulated to standards based on the most Recent Dietary Recommendations and Regulations From Several Federal and state Agencies. Another Great thing Was Warner Bros. Consumer Products’ and Safeway’s Eating Right Kids Initiative was highlighted by the Federal Trade Commission for it’s ability to have a positive impact on Childhood obesity. Ok I have a confession to make! I was able to review the weight watchers Ice cream line and will admit that I seen them before but never actually bought them. I thought they might be lacking Flavor but I will admit that I was wrong and if you know Me you Know How Much I hate to admit that I am wrong! I actually can’t even tell the difference and I even caught the kids eating them lol. My favorite is English Toffee Crunch. And as most females out there I am always trying to lose weight so this makes my Guilty pleasure even more enjoyable English toffee and cool, creamy toffee ice cream – what could possibly be better than that ladies? Offered in a 12-pack, each English Toffee Crunch Bar contains low-fat toffee ice cream, a milk chocolate-flavored coating with toffee pieces, 110 calories, 6 grams of fat and 2 grams of fiber. And only 2 pts! So Next time your craving something give them a try then you will thank me later lol!